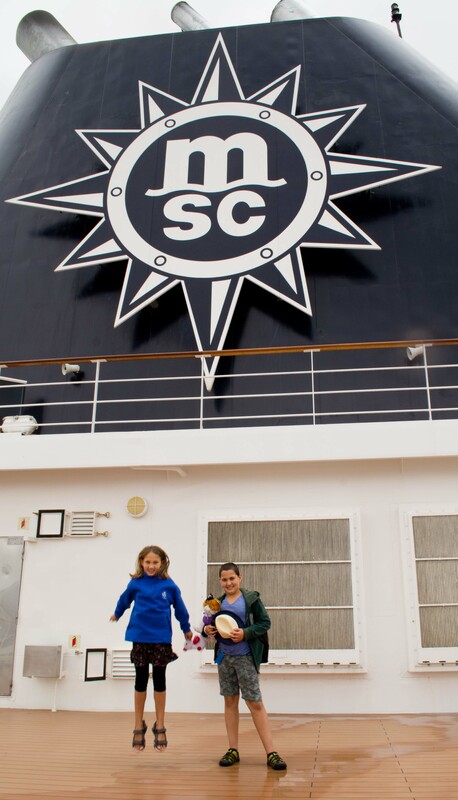 Okay, so you’ve found a great deal and you’ve bought your ticket to cruise with MSC Cruises. Whether you buy your ticket a month before or 6 months before, you will eventually get an email in about extras…one of many, actually. You get offered everything from water to photography packages. *If you haven’t bought your ticket yet, and you’re unsure of what kind of room option to choose, I’ll add a paragraph about this at the end of this post. So, what do you buy? What do you actually need and what is very, very optional? If you’re on a tight budget, the last thing you want to do is make this trip even more financially stressful, and the South African Rand is not in a good enough state, for you not to have heart failure, every time you need to pay in USD. As I write this, you’re looking at multiplying everything by about R14. If you have no sense of what things cost on the ship, this might not sound awful. But this is why I’ve chosen to share this information with you, so you can be better prepared than we were. Two scoops of ice cream $2.80, virgin cocktail $3-$5, 1.5l water $3. I am focusing on what I consider essential as it is flippen hot on the boat (we sailed in November). We equipped ourselves with a water package (14 1l vouchers), an ice cream and soda package (10 vouchers) and a zero proof package (12 vouchers). Dolls and Lego sell for around $30 – $150. About halfway through the trip, all times from The Logo Shop sell for 50% off so if you’d really like a t-shirt or hat with the MSC branding, wait a day or two before you buy. Swarovski jewelry and key rings start at about $14. While water coolers are scattered throughout the boat, mainly in the restaurants and buffet areas, if you disembark for excursions, you will want to take a bottle along with you. You are not allowed to fill your own reusable water bottles at these machines, due to hygiene concerns, but I will leave the decision up to you. About 3 days into our trip, we only had 4 ice cream vouchers left. And yes, the ice cream is DELICIOUS! We still had 10 of our zero proof vouchers left and 10 water vouchers. If I knew better, I wouldn’t have bothered with the zero proof vouchers (the menu only includes 5 virgin cocktails) and rather bought a booklet of ice cream and soda vouchers for each person. We don’t drink but if you do, I would suggest you equip yourself with sufficient vouchers to keep yourself going for the entire cruise. After people watching, I would suggest to budget around 4 vouchers per person, per day. It is still the cheaper option rather than paying around $5 every time you want a drink. $20 per person, per day, times R14 is INSANE! You’ve probably been saving a long time for this trip and, the last thing you want to do is be stuck on the boat, while everyone hops off to go on their excursions. When we saw that the cheapest excursion costs $10 per person ($50/person was the most expensive), we nearly fell over. No matter how much you budget and save, you will feel unprepared to face that kind of additional cost. We pretty much resigned ourselves to be part of the losers, who were too poor to leave the boat. Fortunately, we received notification the night before the island stop, informing us that all we needed to do was collect tickets on the morning of the excursion and we could get off the boat with everyone else. While this didn’t include an excursion on the island, it did include a trip from the ship to the island via ferry and a beach barbecue on the island with everyone else. Which is a whole lot better than being left behind on the boat, like a chop. But without the $40 per family (x R14) expense. When you board the boat, you will be encouraged to load a minimum of $150 onto your cruise card for purchases. This can be used for duty free items like chocolates, perfumes and cosmetics. If you want to buy anything else like photos, excursions or gamble it away at the casino, I’d suggest you use your cruise card for this. There are daily specials for booze, salon treatments and the casino, so I would rather recommend using the $150 you’ve loaded for these items so that you can take advantage of the deals that come up. This $150 doesn’t get refunded without a huge fuss (I’ve heard) so, use your discretion. If you need to see a doctor while you’re on board, it will cost you $150. Ja, I know! We simply ignored the suggestion of linking a credit/debit card to our cruise card (where $150 would automatically be deducted whether or not you planned to spend) and left the ship without spending a cent this morning #winning. My recommendation: don’t bother buying a photo package. Early on, the photo studio ran a special offer where, if you bought 25 photos, you get a free Android tablet. I don’t think you’d qualify for this if you bought a package. Half way through the trip, you could buy 2 photos for the price of one. But I’ll leave the decision up to you. The photos I’ve seen aren’t all that impressive (super posed and awkward) #justsaying. If you’re into shopping and casinos where you will be spending most of your time in air conditioned areas, you might not feel the need for too many drinks and ice cream vouchers. People with kids spend most of their time around the pool so, ice cream and drinks are what we need. People cruising without the kids may choose differently. Whichever way you book your cruise, you will be asked what kind of room you’d like. Unless you have found an amazing (fill up the boat) special a few weeks before the cruise departs, you might be stuck in the “whatever is cheapest” option. The cheapest option in an inside cabin with no porthole. The next option would be an outside cabin with a (often obstructed) porthole. The most expensive option is the one with the balcony. 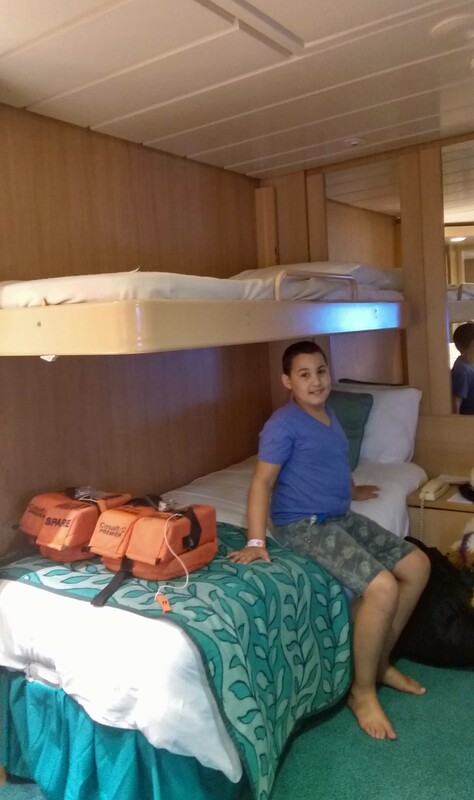 We chose the inside cabin option and I wouldn’t bother paying extra for a porthole since it is, more often than not, obstructed by a lifeboat. If money is not a problem for you, I would suggest selecting the balcony option. The couple we chatted to yesterday confirmed that their family, balcony suite has a double bed and a double sleeper couch for their kids. Which sounds more comfortable than the bunk beds we’re in. (They got a great deal through Diner’s Club a few weeks before the ship was due to depart so they paid even less than we did!). That said, you literally only go to your cabin to sleep so, once again, I’ll leave the decision up to you. And despite what your travel agent might tell you, a cabin without a porthole isn’t super dark. Enough light from the passage outside sneaks in under the door. If you’re concerned, pack a night light. In my opinion, it isn’t worth paying extra for just a window that will probably have a life boat hanging outside it. My next post will cover what there is to do on board and how to pack accordingly. I will also deal with electronics, styling tools, chargers and the in room TV in this post. This is a great post. I love how you discuss the reality vs the ‘Oh it was perfect ‘ posts and discussions we usually see. 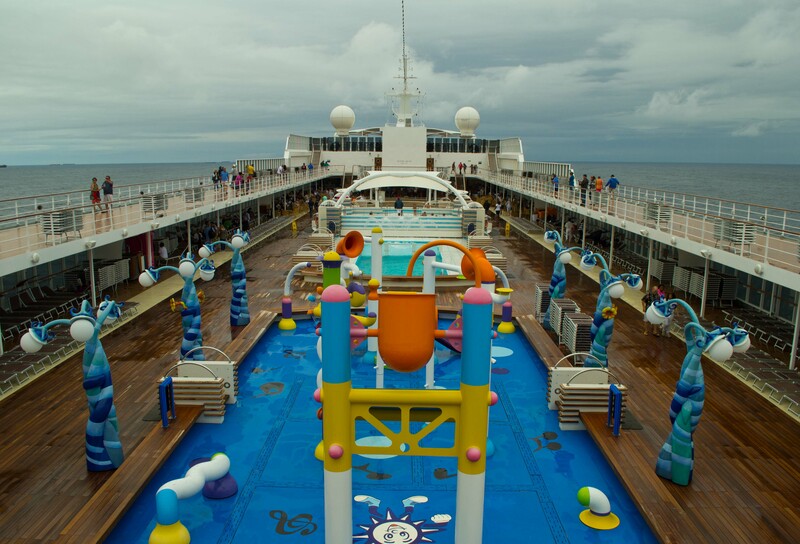 The first I heard of the lack of water on these cruise ships was when a cousin told me. I was shocked, I mean seriously Water is a basic need. Thanks for the info, most useful. One question – are all beverages, including those at mealtimes extra cost or are you entitled to coffee or juice or whatever in the restaurants? Also, are the voucher packages only available pre-cruise? I have Scottish blood – I need to know these things. Oh! With regard to the pre-cruise purchases, it is a little cheaper to buy it before you cruise but you can buy it on the boat if you’d prefer. Of course, with the fluctuating exchange rate, you might be able to benefit from buying the package while it’s still a it cheaper than it would be at the time of your cruise. Thanks for your post. Very helpful for a South African looking for more information than packing highlighters and post it notes 😂. Feel a lot more prepared in terms of what to expect expense and beverage wise. Thank you so much for your comment, Bridgette. It is much appreciated. We are so glad to hear that you found it useful. Have a lovely trip!